With the inauguration behind us, we return our focus to incoming data. Also, please note the client approved WCA Viewpoint 2017 is now available. 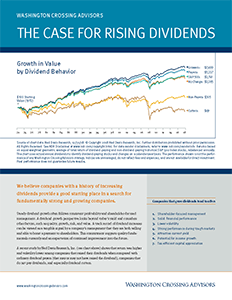 The stock market’s move from last spring discounts the improved growth prospects developed over the last 6-9 months. Incoming economic data and better results from companies painted a better picture through the fall and drove much of the gain in stock prices. 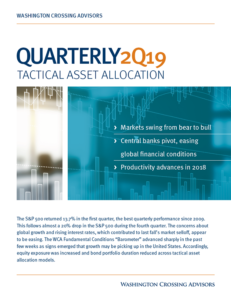 The momentum helped lift the United States’ equity market capitalization $3.6 trillion (16%) to over $25.5 trillion from $21.9 trillion a year ago, the 2.5% 30-year U.S. Treasury bond fell 20%, and recent stock market volatility is now very low. The bottom line is clear; markets are leading the economic reality, and now it is necessary for the economy to deliver results. We have seen this movie before, however. A start-stop pattern of growth is a familiar one this cycle, so it makes sense to take some of the “feel good” market moves of late with a grain of salt. Therefore, our base case now sees a moderation in the pace of improvement through the first part of 2017 just as President Trump begins his first 100 days. Campaign trail promises now need to be acted upon and in coordination with Congress. Political realities should exert themselves within the new president’s first hundred days. The upcoming March debt ceiling, for example, will throw a spotlight on issues of fiscal “responsibility” just as plans are being put in place to grow the deficit. As Congress prepares to negotiate these and other fiscal changes, monetary conditions are already incorporating anticipated outcomes. The Federal Reserve (Fed) recently raised their long-run forecast for rates as forecast long-run inflation priced into TIPS broke through 2%. The dollar also rose 7% through the fourth quarter in anticipation of faster growth and higher rates. The anticipation of a fiscal plan seems to be accelerating the normalization of monetary policy; a potential negative should the trend accelerate from here. The plan not only needs to be formulated, but passed, and financed. Each of these links in executing on the incoming administration’s plan carries its own unique challenge. 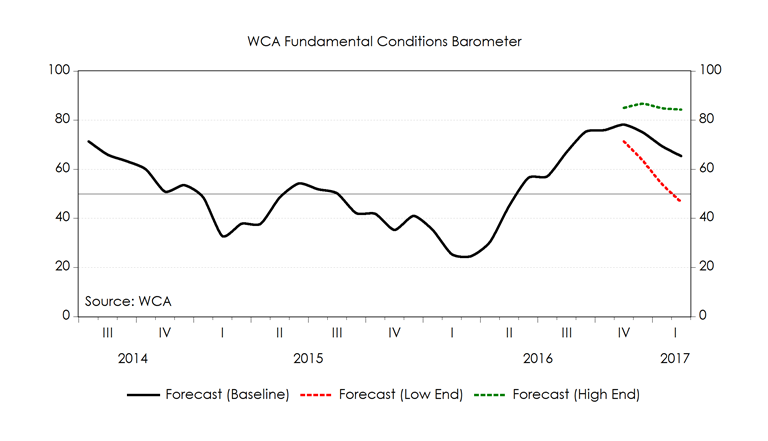 We view changing fundamental conditions through the lens of our WCA Fundamental Conditions Barometer (below). With the 50 level suggesting the dividing point between improving conditions and deterioration, we anticipate the likely path for the barometer to remain in “improvement” mode into the spring. However, our baseline forecast envisions some moderation in the pace of improvement. The chart depicts the index and its expected baseline path, along with a high and low-end near-term forecast. We think, therefore, the near-term odds of a recession are below average, in our view.